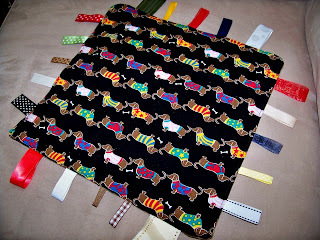 When I first started my sewing adventures a few months ago, I saw a taggie blanket tutorial and thought it would be really fun and simple to try. I bought the supplies a couple months ago to make for my new nephew. Of course life and the end of the school year happened and suddenly it was 2 days before he was to be born! So I got on it! 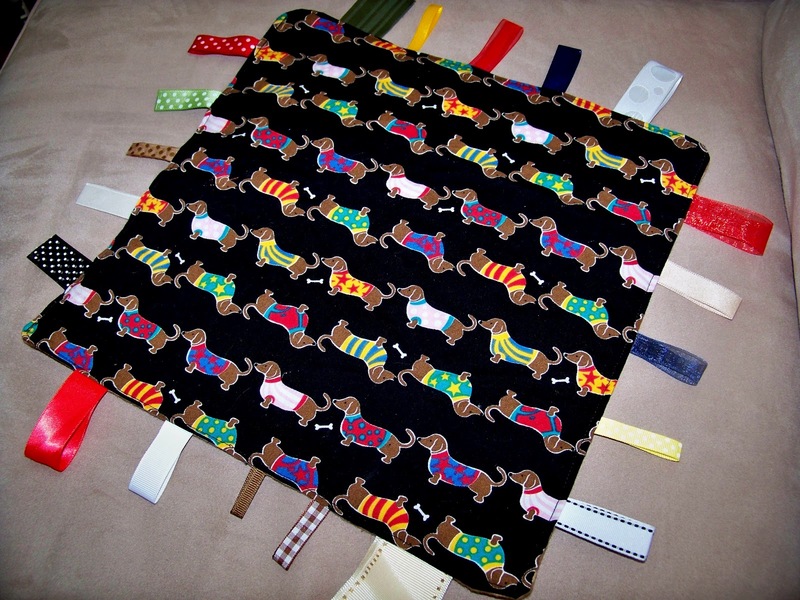 My brother-in-law and sister-in-law (Adam's bro and his wife) have 2 weiner dogs, so when I saw the fabric, I thought it was perfect! I found this tutorial that was pretty simple and similar to what I had in mind. In addition to loving the iPad for baking, it is also great for craft projects! I can have it set up right next to me and follow along with whatever tutorial I am using, or look something up, right with the touch of my finger! I started with 2 13x13 inch pieces of fabric. I actually meant to make them 14, but I apparently can't use a ruler correctly. 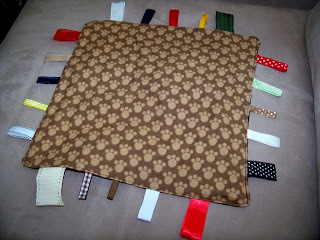 I picked out 20 different ribbons of coordinating colors, patterns, and different sizes and textures. I really tried to pick a lot of different textures, because different babies like different textures. But also, a taggie blanket is a sensory experience for a baby. They get the opportunity to explore colors, shapes, and textures. Luckily my mom has all the ribbons in the world and I went shopping in her basement. You could pick out 5 different ones and repeat a pattern around the edges if you want. I cut 5 inch pieces of ribbon and laid them around the edge in the pattern I wanted. I followed the tutorial advice and tried to put wider ones on the corners. Pin them to the right side of one of the fabrics, loop side facing in. I am not brave enough to do what the tutorial did and just place the other fabric on top. So I sewed around the edge one time to hold them in place. Then I took out the pins. Pin the other fabric (I did the paws coordinating fabric, but you could do the same fabric or a solid coordinating color), right sides together, on top of the other one. Kristin told me how much Grady loved a good crinkle blanket. I found some crinkle material at this etsy shop and ordered it for the project. As I started to make it, I realized it wasn't wide enough to cover the whole pieces I cut. SO I just pinned it top and bottom and it didn't go all the way to the edges on the sides. I liked this crinkle fabric because it is machine washable. And specially made for toys. I sewed around the edge 2 times while it was still inside out. I don't want those ribbons coming out in my nephew's mouth! I left a little 3 inch opening while sewing, and then turned it right side out. Voila! The ribbons are sticking out the right way! I sewed a top stitch around the whole thing (which also closes up the open hole). One last opportunity to do a last stitch on those ribbons. 4 stitches to hold those babies in! The final project for my new nephew. He was born last week and is amazing!